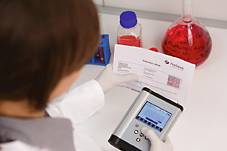 The Fibox 4 works with sensor type PSt3 (detection limit 15 ppb dissolved oxygen, 0 - 100 % oxygen). With the Fibox 4 trace additionally trace and ultra low oxygen concentrations can be measured. It is compatible with sensors type PSt3, PSt6 (detection limit 1 ppb dissolved oxygen, 0 - 4.2 % oxygen), and PSt9 (detection limit 0.5 ppm, 0 - 200 ppm gaseous oxygen). The wireless Fibox 4 and Fibox 4 trace are designed for easy handheld use. The robust, light housing is splash proof and the controls - color display and buttons - were contrived so they can be operated even while wearing heavy gloves. The optical oxygen meters adapt to dry and humid environmental conditions. Like all other PreSens transmitters they are temperature compensated systems and have additional automatic compensation for pressure and salinity. The integrated long lasting battery - rechargeable via USB - together with the immense storage capacity allow for prolonged computer-independent use of the optical oxygen meters. The optical oxygen meters are compatible with the existing PreSens sensor portfolio. All PreSens oxygen sensors will be delivered with a barcode. With the oxygen meters´ integrated barcode reader sensor identification and calibration can be realized by performing just one scan, and measurements can be started immediately. A new sensor management system has been implemented where data of up to 100 sensors can be stored. This ensures a fast work flow while conducting most precise oxygen measurements. Fibox 4 and Fibox 4 trace are delivered with the PreSens Datamanager software allowing data transfer to a PC for further data analysis. Sensor and user management as well as all measurement data can easily be transferred between the optical oxygen meter and the PC. The data management and data export will improve and speed up your analysis. The optional extended software version is database supported and offers simultaneous control of multiple devices so measurement networks can be set up.